Henry A. Wise was a lawyer, a member of the US House of Representatives (1832–1844), US minister to Brazil (1844–1847), and governor of Virginia (1856–1860) during John Brown’s raid on Harpers Ferry, and a brigadier general in the Confederate army during the American Civil War (1861–1865). Born in Accomack County on Virginia’s eastern shore, Wise rose to national prominence during the political turmoil of the late antebellum period. A fiery politician and gifted orator with a mercurial temperament, he advocated a number of progressive positions, including capital improvements in western Virginia, broadening Virginia’s electoral base through constitutional reform, and public funding for universal elementary education. Wise also was a stout defender of slavery and eventually became an ardent secessionist. Perhaps best known for being governor when Brown attempted to spark a slave rebellion at Harpers Ferry, Wise had the authority to commute Brown’s death sentence. Instead he allowed the execution to take place, making possible the radical abolitionist’s ascension to martyrdom. After Virginia’s secession in 1861, Wise served in the Confederate army. In 1872, he supported US President Ulysses S. Grant, the former Union general-in-chief, in his campaign for reelection. Henry Alexander Wise was born in Drummondtown on December 3, 1806, the son of John Wise and Sarah Corbin Cropper Wise. John Wise served as a major in the Virginia militia after the Revolutionary War (1775–1783) and held a seat in the Virginia House of Delegates (1790–1800). A prominent and wealthy landowner in Accomack County, John Wise married twice and fathered ten children. He died in 1812, followed by Sarah in 1813, making young Henry Wise an orphan. Two paternal aunts and his grandfather, Revolutionary War hero John Cropper, took responsibility for raising the boy. Wise received only a small amount of land after his parents’ death, perhaps spurring his decision to pursue a legal career. Educated by private tutors until he was twelve, he then attended Margaret Academy, near Pungoteague, in Accomack County. Wise later lamented that his time at Margaret Academy did not serve him well, but one of the teachers there suggested Wise’s next step: Washington College in southwestern Pennsylvania (now Washington and Jefferson College). He studied there from 1822 until 1825. Wise returned to Virginia to read law in Winchester with the prominent attorney Henry St. George Tucker, completing his studies in 1828. In the same year, Wise married Ann Eliza Jennings. The couple moved to Nashville, Tennessee, where Wise practiced law and contemplated a number of business opportunities. He also became acquainted with President Andrew Jackson, a friend of the Jennings family; the newlyweds honeymooned at Jackson’s estate, the Hermitage. Lacking funds to engage in land speculation in Tennessee, Wise returned to his own, relatively modest farm, called “Only,” on the eastern shore of Virginia in 1830. The couple had four children before Ann’s death in 1837. Wise soon flourished in the political arena despite lacking some of the traditional traits of antebellum power brokers. He did not inherit great wealth; in fact, he would reach middle age before attaining the level of financial freedom he had long desired. Moreover, Virginia’s sparsely populated eastern shore made for a poor political base, and many residents there identified with Baltimore, Maryland, and Philadelphia, Pennsylvania, as much as Richmond. Still Wise possessed a keen intellect, a fierce independence, and a flair for public speaking. He earned a reputation as a formidable opponent in the rough-and-tumble politics of the day; he debated with great fervor and often spoke for hours at a time when campaigning. These skills propelled Wise into the thick of Virginia politics, where he would stay for the next three decades. Elected to the US House of Representatives in 1833 as a Jacksonian Democrat, Wise won a narrow victory over Richard Coke. The candidates engaged in a bitter campaign, leading to an 1834 duel in which Wise seriously injured Coke, shooting him in the shoulder. In Washington, DC, Wise bucked his party—and his friend in the White House—by opposing the Democrats on two of the major issues of the day: the Force Bill and the president’s efforts to crush the National Bank. The Force Bill, which eventually passed, authorized Jackson to send federal troops to South Carolina to end the Nullification Crisis there. Wise opposed the Carolinians’ efforts to nullify a federal tariff; however, he supported states’ rights and the right to secede but only as a last resort. This would be only the first of many occasions when Wise confounded his nominal allies; he also habitually criticized Virginia’s tradition-bound political elite. Wise left Congress in 1844 after winning election five times. Reflecting his flexibility and his loyalty to President John Tyler, he won two terms, in the middle of his tenure, as a member of the Whig Party, a new party formed in part to oppose Jackson. During this period he married his second wife, Sarah Sergeant, in 1840; the couple had ten children, but only three survived infancy. Sarah Sergeant Wise died during childbirth in 1850. Wise married Mary Elizabeth Lyons in 1853, and the couple had no children. 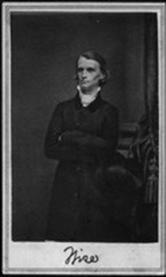 After leaving Congress, Wise accepted Tyler’s appointment as minister to Brazil, where he served from 1844 until 1847. The Virginian’s tenure was controversial, largely due to his outspoken criticism of Brazil’s continued participation in the international slave trade. After his return from South America, Wise entered the debate over a new Virginia state constitution. He was a major force at the constitutional convention of 1850–1851, which resulted in a new compact that increased the representation of western Virginia in the General Assembly. He advocated policies that included internal improvements to facilitate economic advancement and universal education, and he sought the governorship to further these goals. Wise won the gubernatorial election in Virginia in 1855. His quixotic positions variously aligned him with both Democrats and surviving elements of the now-defunct Whig Party. As the national debate over slavery escalated and the issues became more complex, he moved from one position to another in a vain search for common ground between pro-slavery, states’ rights advocates, and their antislavery opponents. His interest was in protecting both slavery and the Union. In 1859, however, such hopes ended with John Brown’s failed attempt to initiate a slave revolt at Harpers Ferry, Virginia (now West Virginia). Brown’s small band was captured by United States Army forces led by Col. Robert E. Lee, and Brown received a death sentence for treason and murder. As governor, Henry Wise held the power to commute Brown’s sentence to life imprisonment, a move that many moderates and Northern abolitionists advocated. Wise briefly wavered and considered ordering Brown to a mental hospital. But after he met personally with Brown in his jail cell, Wise decided that the man failed to meet any standard for insanity. Instead the governor allowed the execution to take place, partly out of respect for Brown’s high sense of purpose but also to send a strong message to abolitionists. In death John Brown instantly became a martyr, but Wise, too, gained notoriety from the incident. The governor’s handling of the crisis resulted in renewed support among Virginians and some talk of Wise as a presidential candidate. The tumultuous election of 1860, though, found Virginia Democrats struggling with both the Northern and Deep South factions of their party. Wise hoped that his stature would allow him to enter the fray as a compromise candidate; another Virginian, Robert M.T. Hunter entertained similar designs. But instead the Democrats split into geographic factions and nominated two other candidates, US Senator Stephen A. Douglas of Illinois and US Vice President John C. Breckinridge of Kentucky. The Democrats’ division helped ensure the election of the Republican candidate, Abraham Lincoln of Illinois, and the secession crisis ensued. As the nation teetered on the edge of civil war in the spring of 1861, Wise favored disunion—an ironic twist after he had largely opposed the Carolinians’ talk of secession during the Nullification Crisis. In April 1861, he exerted considerable influence as a delegate to the Virginia Convention of 1861 meeting in Richmond. Wise vigorously attacked Unionist members by questioning their devotion to Virginia, and his son Obadiah Jennings Wise beat the drum for secession as the publisher of the Richmond Enquirer newspaper. John Baldwin of Staunton dramatically engaged Wise in a heated debate, arguing that his actions presumed secession before secession had been approved by the convention or confirmed by Virginia voters. Wise responded that delay could mean ruin for Virginia, and in the end his argument won the day. The convention voted to secede on April 17, 1861, and the ordinance passed the statewide referendum on May 23. During the war Wise was a so-called political general in the Confederate army of Northern Virginia, appointed brigadier general because of his political connections and despite his complete lack of military experience. His lack of expertise showed in his poor performances in the Kanawha Valley campaign (1861) and at Roanoke Island (1862). Wise’s leadership improved, though, and he performed ably at Petersburg (1864–1865) and on the retreat to Appomattox Court House in April 1865. After the war Wise resumed his law career. He never sought a pardon for his Confederate service but publicly deemphasized his role in Virginia’s secession and supported US president and former Union general-in-chief Ulysses S. Grant during his 1872 reelection campaign. Wise, the father of fourteen children, only seven of whom survived infancy, also spent considerable time with his family. He died on September 12, 1876, in Richmond. Source of information: Information about Henry A. Wise was contributed by John M. McClure, and is courtesy of Library of Virginia, a publication of the Virginia Foundation for the Humanities, in partnership with Library of Virginia.